Jamie has just uploaded the movie of my talk “The Why and How of Automated Testing with Python and Django” which I gave at BrightonPy a week ago (and this time it really is a movie, clocking in at a feature length 1 hr and 35 minutes). The audio on the video is fine (and arguably the laptop-eye-view video is improved by chopping my head off for large parts of the talk), but it’s tricky to see the slides on the video, so I’ve uploaded them to slideshare. The talk rambles a bit in places and there are a couple of things that betray my static language roots for example you can’t actually use unit tests to discover dependencies as easily in python as you can in C++. I’m also already evolving the JS testing stack I talk about here: moving from qunit, qmock and Selenium to jsmockito and possibly JsTestDriver. Overall I think it’s a pretty good overview of how an agile software engineering process can be screwed together. Many thanks to @garethr for donating his Fabric scripts, Spike for his database migration cameo, Si for recommending Hudson, Dave for hooking me on automated testing and j4mie for organising the night and wrangling the video. If you’d like me to help your organisation improve its agile engineering process, please get in touch. In order for m0cxx0r to be useful for writing tests at Linden Lab, it needs to work on all of the platforms that we target with C++ applications, so today I tried building and running m0cxx0r on Windows. 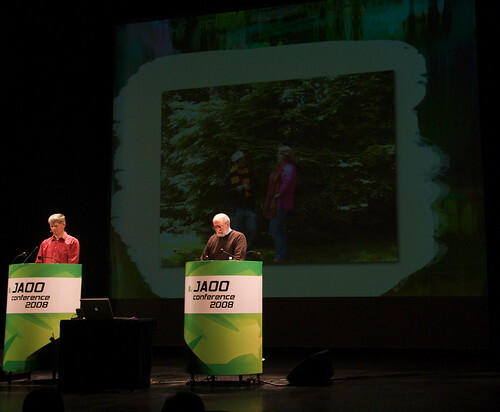 Last week I was invited to talk at JAOO Denmark. Originally a Java conference, JAOO is now a very broad software development conference covering everything from agile to language design to distributed systems.